As the cities of humanity grew, their appetite for energy became more voracious. It was no secret that one day the energy sources would run out. They extracted power from a wide range of sources, including everything from fossil fuels to nuclear power. Unfortunately, the day of reckoning came much sooner than anticipated and the world was running out of power. Greed, mismanagement and waste made it a reality sooner than it should’ve been. The desperate lack of power sparked energy wars and the world began to crumble. Then, a strange wormhole appeared just outside the solar system and from it emerged an ocean planet with an abundant supply of zero point energy crystals. However, obtaining them turned out to be harder than expected, as alien creatures began to emerge from the sea to stop the energy collectors. You are part of the Defense Task Force, and have been charged with the job of protecting the collector on your energy collection platform. Can you hold off the hordes and collect the precious energy crystals? 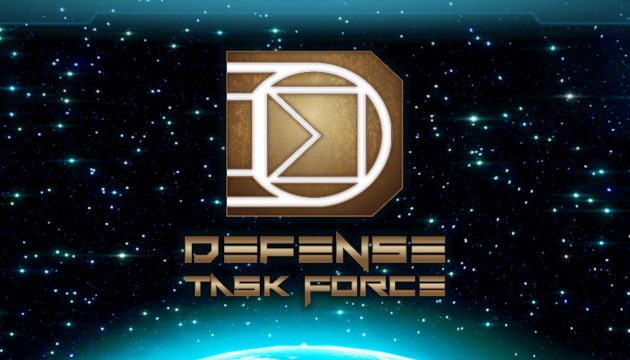 Defense Task Force is a tower defense game. You have an arsenal of about ten types of towers to use strategically to hold off the advancing alien hordes. They range from machine gun and missile turrets up to plasma beam and tesla towers. As your defenses neutralize more and more enemies, you will earn energy. This energy can be used to build or upgrade towers. Upgrades are not available until you unlock them via the research screen. 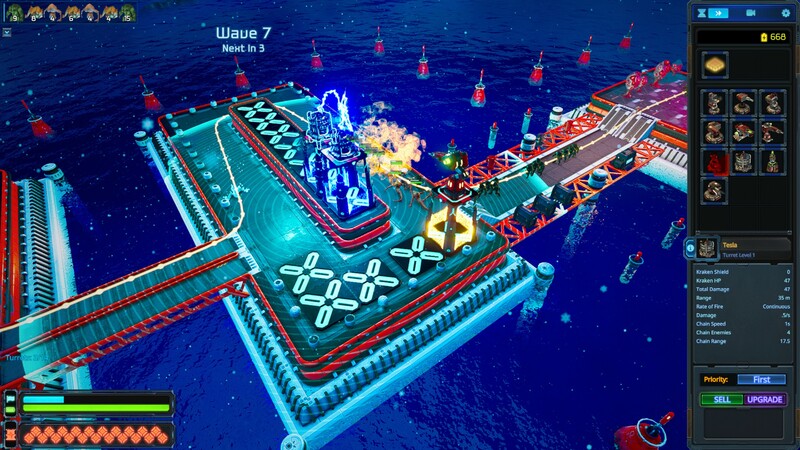 The game also features a sort of experience system, where the more waves you survive in a level, the more points you get. These points accumulate and increase your rank, which unlocks more research possibilities. However, earning more points on subsequent runs requires you to survive longer than you did before on a given level. This is the free starter blueprint for your energy collection platforms. 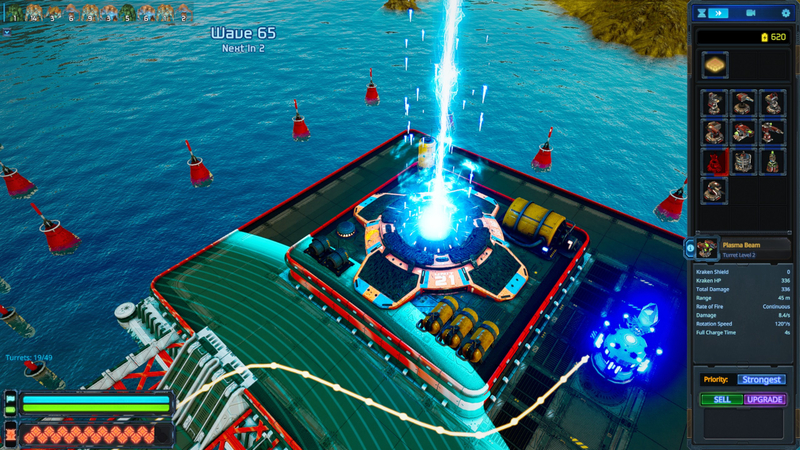 Beyond research, energy collected in levels can also be used to unlock new blueprints. Each time you start a game, you get to choose a blueprint to deploy, which defines the size and shape of your platform. The screenshot above is the starter blueprint, which gives you a small and very limited platform to work with. 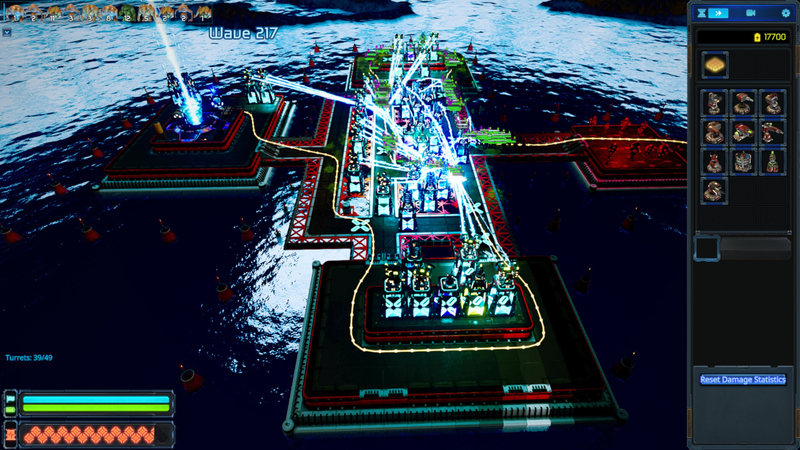 You can research bigger and better blueprints that give you more room and many more tower pads to give you room to expand your defenses much further. Blueprints do have an energy cost each time you deploy them, but the first blueprint costs nothing to deploy when starting a new battle. This way you can’t get stuck in a situation where you don’t have enough energy to deploy a blueprint and not be able to play anymore. The X pads are tiles where you can build towers. Some of them are on the paths because you can force the aliens to take different paths by blocking certain ones with towers. Part of the trick to surviving longer is to use bigger blueprints and of course to create the longest possible paths for the aliens to follow. Space time towers also help, as they slow down aliens within their area of effect. The research screen lets you to upgrade your collector and research ways to make your towers stronger. 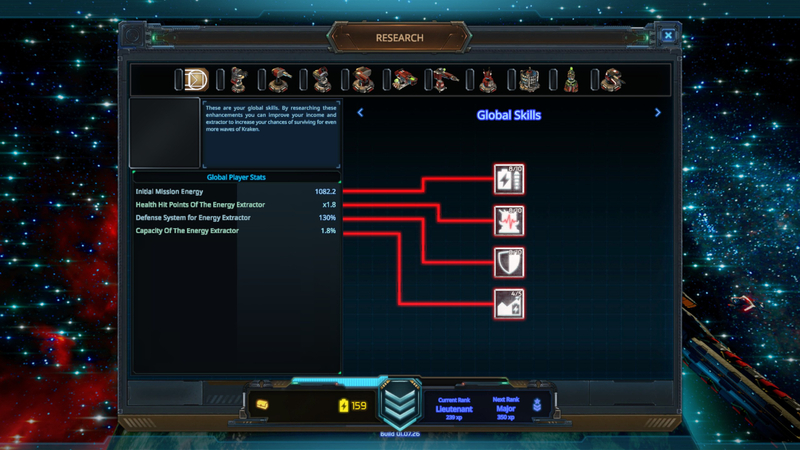 The research screen has a bunch of tabs. The first one, as you can see above, lets you research stat upgrades for your energy collector, such as HP, energy capacity, and the strength of its automatic defense system. They are all red in the screenshot because I didn’t have enough energy to research any of them further at the time. There is also a tab for each tower type. You can research tier two and tier three upgrades for each type of tower. Once researched, you can upgrade your towers in battle individually. You will have to kill lots and lots of aliens to get enough energy to upgrade a tower to tier two, and much more to get it to tier three! Towers have more upgrades than these, though. Once the tier three research upgrade is unlocked, you gain the ability to research stat upgrades for that tower type (similar to the ones for the energy collector). Some of these can be researched up to 100 times to keep improving such stats as the tower’s damage rate and rotation speed. The energy collector must be protected at all costs as it collects energy from the zero point crystals. The early part of each battle is a dangerous time. Strategy is most important, as you don’t have much energy to work with yet. 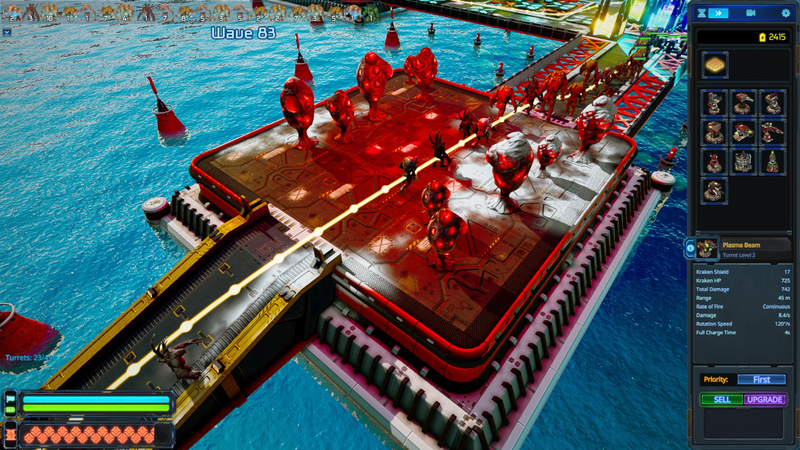 If your initial strategy is successful enough, you’ll be able to eventually build up much bigger defenses to hold off the far larger hordes that are waiting in your future. If the collector’s HP reaches 0, it’s game over. Each level can be played as many times as you want to earn more energy and try to survive longer than you did before. The game features five different sectors, each with four different areas to play in. Each one has a goal of surviving a certain number of waves. If you can defeat that many waves of enemies before you fall to their endless incursions, a message box will appear saying you’ve conquered this area. It gives you the option to stop playing or keep playing to earn more energy. Clearing this goal doesn’t really have any effect on the game other than the area select screen will say that you’ve conquered this area. Conquering an area means you reached a somewhat arbitrary goal of surviving a set number of waves on a given level. None too happy about your energy collection efforts on their world, the aliens emerge from the sea to attack your platform. Monster waves are procedurally generated (as are the background terrains) and slowly ramp up in size and power. They are also endless, at least until your collector dies. Every now and then, a more intense than average wave will appear to keep you on your toes. If your defenses aren’t good enough, this can cripple them. This is because the turrets nearest the collector are still firing on the remnants of that bigger wave, leaving the next incoming wave free to make it further in since they’re taking less weapon fire than usual. You can see an info icon on the left edge of the right panel in the screenshots. This will pull up the in-game encyclopedia description for the selected tower or alien. You can view the encyclopedia in its entirety between missions. The red bar in the lower left is the collector’s health. 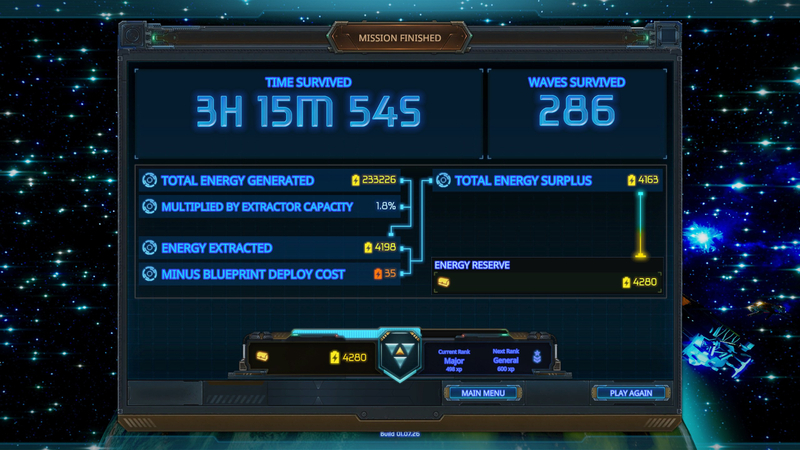 The blue bar shows your progress toward conquering this area, and the green bar shows surplus energy collected in this mission. You can mouse over to see the exact amount and how much you spent to deploy your chosen platform blueprint. Aliens emerge from the sea and walk up the yellow ramp to assault your energy collection platform. While battles are the toughest early on, they get easier for a while once you get some tier two towers set up. Once you’ve unlocked tier three tower technology, you can survive much longer as you can see below. That screenshot is the summary for my best run so far, where I almost reached wave 300, but the game decided to deny me! I earned well over 4000 energy from that battle, though it took over three hours. By the end, I had my platform full of tier three towers and was mostly just watching the game rather than playing. At that point there wasn’t too much for me to do but wait and see how long my defenses lasted. The game does have a speed option in the upper right corner of the screen. There are four game speeds you can switch between, allowing you to speed up time in situations like this. You may notice in the image below that the total energy generated is far higher than the amount you get to keep. The amount you get to keep is determined by the energy collector’s capacity, which in this case is 1.8%. This is one of the collector stats that you can improve through research. 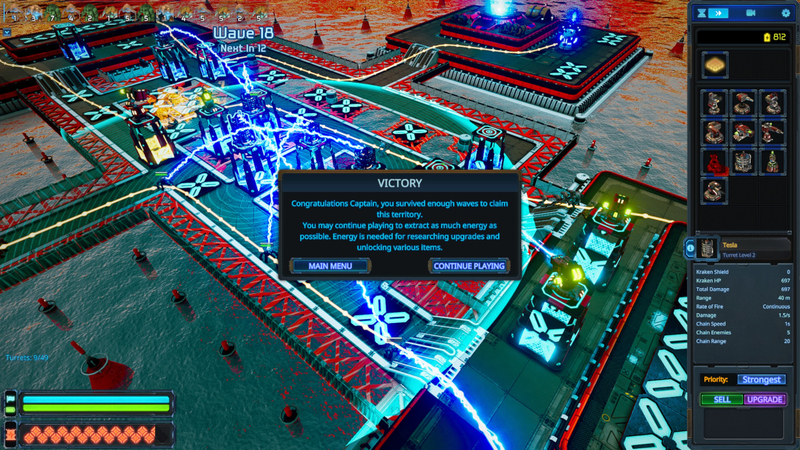 When your defenses finally fall to the endless waves of aliens, you get a summary of your battle. The graphics are HD and not too bad. Sometimes it will rain or snow, which changes the appearance of the platform but has no effect on gameplay. You can see a little snow in the screenshot of the aliens emerging from the sea. The game does sometimes experience dropped frames, where it will freeze for a fraction of a second. This seems to happen sometimes when the daylight time changes. It’s not a fading day-night cycle, but rather every so often the lighting just changes somewhat abruptly. The music track is great and the sound effects are pretty good, too. The image below is a larger platform blueprint, but it is by no means the largest in the game. There are much bigger ones that give you much more freedom in creating long, complex paths for the aliens to follow. So there is plenty of room to survive much longer than I did on this run. Defense Task Force felt much too hard at first, but once you have found a good early strategy and have tier three tower tech unlocked to help you survive much longer, it feels far easier. I should also note that the game has four difficulty levels, but you have to start a new game to change the difficulty. There are also eight save slots. It’s not a bad game, but I would say that Defense Task Force definitely doesn’t beat games like Defense Grid 1 and Defense Grid 2. It took about 20 hours to get to where I am. I still have a couple towers that don’t have tier three tech unlocked because I haven’t quite reached the rank of General yet. I haven’t even researched any of the stat improvements for tier three towers either, or a handful of the biggest platform blueprints yet. 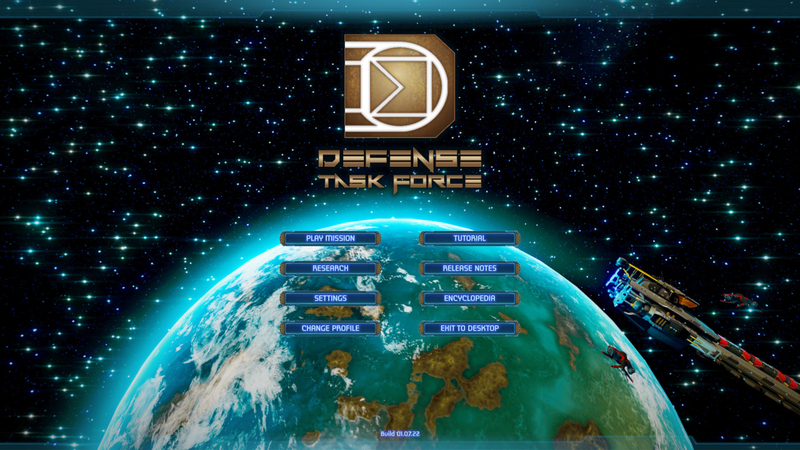 Defense Task Force is available on Steam for $24.99. So there is room for a lot more playtime here. How long can you hold off the alien hordes before your defenses crumble?